As a nation of chocolate lovers (on average each of us happily munch our way through approximately 10.2kg of the stuff per year) we are incredibly familiar with the almost infinite variety of chocolate bars and snacks that fill our shop and supermarket shelves. Yet not quite so many of us are acquainted with chocolate in its raw and certainly most nutritious form. Below, we answer what are cacao beans and explain just what makes them so special. All of your favourite chocolate bars and snacks are, to some extent, made from cacao beans. The amount of genuine raw cacao bean that is used in the finished product, however, will largely determine its quality and nutritional value – in general, the more raw cacao bean that a chocolate product contains, the better. But first, what are cacao beans? 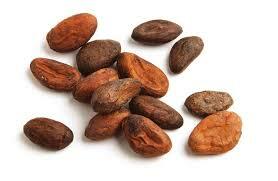 Cacao beans are found in the fruit (cacao pods) of the cacao tree, a tropical plant native to Central and South America. The cacao pod is crammed with a sweet fruit pulp that contains 30 to 50 large seeds or cacao beans. These ‘raw’ cacao beans are soft and white and only turn their well known ‘chocolate’ brown during the drying process. There are three main types of cacao bean, the Forastero, Criollo, and Trinitario. Whilst Forastero cacao beans are the most commonly used (and account for some 95% of the world’s cocoa production), the cacao beans from the Criollo are considered the finest. Local farmers first extract the cacao beans and fruit pulp from the cacao pods using a machete and then leave them in piles to ferment. The fruit pulp undergoes a ‘sweating’ process that raises the temperature of the raw cacao beans and allows them to both germinate and develop their rich, chocolate flavour. The fruit pulp eventually drips away, leaving only the raw cacao beans, which are laid out onto large mats to dry in the sun for several days to weeks. After the raw cacao beans have been dried they are then transported around the world for use as an integral ingredient in a selection of chocolate products. It is what happens next that will influence the calibre of the end product. What makes raw cacao beans so special? Unfortunately, the majority of today’s cacao beans are roasted at high temperatures, which tends to destroy their salutary properties, before being transformed into our best-selling chocolate products (that also happen to be laden with unhealthy refined sugars and milk). However, in their natural state, raw cacao beans are packed with vitamins, minerals, fibre and essential fatty acids that promote a prolonged feeling of fullness, boost energy levels, improve mood and concentration and are extremely beneficial for our heart and cardiovascular system. An analysis of the Kuna Indians (who live on Panama’s San Blas islands) revealed that they enjoyed large quantities of a drink made from raw, unroasted cacao and that this was responsible for their universally low blood pressure, regardless of age. Raw cacao is also used in traditional Chinese and Ayuvedic medicine to treat the heart, kidneys and spleen and thanks to its high chromium content is rapidly becoming known as an effective tool in the battle against obesity. It’s far better to purchase chocolate in its most raw and pure form. Indeed, unroasted raw cacao beans can be peeled and enjoyed exactly as they are or mashed into crunchy raw cacao nibs, raw chocolate liquor, raw cacao powder and raw cacao butter. All of these delicious raw cacao products boast the intense flavour and retain the wholesome goodness of raw cacao beans. And they can be used to prepare a tempting range of organic raw chocolate bars that contain only natural superfood sweeteners and zero fattening dairy products. Which means that irresistible chocolate needn’t be a guilty pleasure after all! The post What are cacao beans? appeared first on Superfood blog - Healthy, Rawfood Lifestyle.